We are in the middle of an ice storm right now. 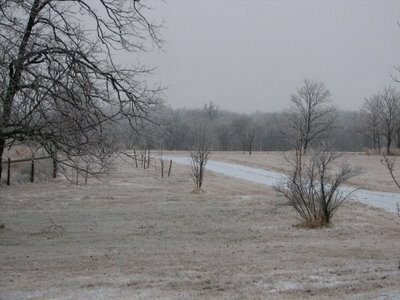 The last two winters we have had ice storms. Oh the fun of living in Oklahoma in the winter. 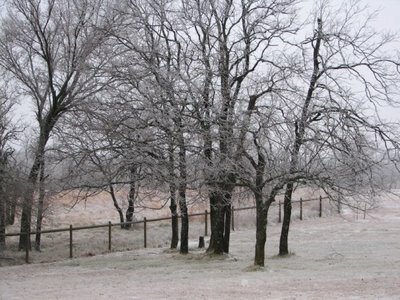 We had ice storms in January of 2007 and another one in December of 2007. Both storms were major storms and had big power outages. We were without power for several days both times. I woke up several times last night and heard the freezing rain and sleet hitting the window. I kept thinking that the power was sure to go off. But when we woke up this morning we still had power. I am so grateful. I really did not want to lose power again due to ice. Since we live out in the country we are not high on the priority list when they have widespread power outages. So I am so glad we still have power because that means we still have heat. We are supposed to get more sleet and freezing rain today, so it will probably get worse before it gets better. We still may loose power, but we at least have it for now. And for that I am grateful. I guess it is scary and no electricity is no fun but it is really beautiful in a stark winter way. Thanks for sharing. I woke up to the same thing! I live just outside Oklahoma City. I hope we both have electricity all day today! Stay warm and safe. Thanks for checking out the blog today. I am glad that you enjoyed it! I am glad you still have power. I am always nervous if our lights flicker now. It brings back memories of when Hurricane Ike came through last fall and we had no power for 15 days. I hope that you are safe still there. take care sister.